Buying a bigger room air conditioner won’t necessarily make you feel more comfortable during the hot summer months. In fact, a room air conditioner that’s too big for the area it is supposed to cool will perform less efficiently and less effectively than a smaller, properly sized unit. Why? An oversized unit will cool the room(s) to the thermostat set-point before proper dehumidification occurs, making the area feel “clammy” and uncomfortable. Central air-conditioning systems need to be sized by professionals. •Set your thermostat at as high a temperature as comfortably possible in the summer, and ensure humidity control if needed. The smaller the difference between the indoor and outdoor temperatures, the lower your overall cooling bill will be. •Avoid setting your thermostat at a colder setting than normal when you turn on your air conditioner. It will not cool your home any faster and could result in excessive cooling and, therefore, unnecessary expense. •Consider using an interior fan along with your window air conditioner to spread the cooled air through your home without greatly increasing your power use. •Avoid placing appliances that give off heat such as lamps or TVs near a thermostat. 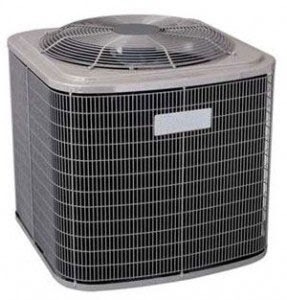 •If your air conditioner is old, consider buying an energy-efficient model. Look for the ENERGY STAR® and EnergyGuide labels — qualified room air conditioners are 10 percent more efficient, and qualified central units are about 14 percent more efficient than standard models. •Consider installing a whole-house fan or evaporative cooler if appropriate for your climate.